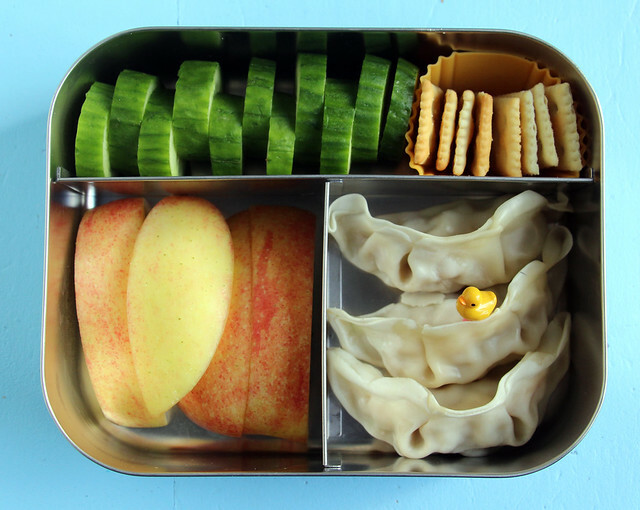 This was one of those Groundhog Day weeks where I felt like I packed the same foods over and over in the boys’ lunches. 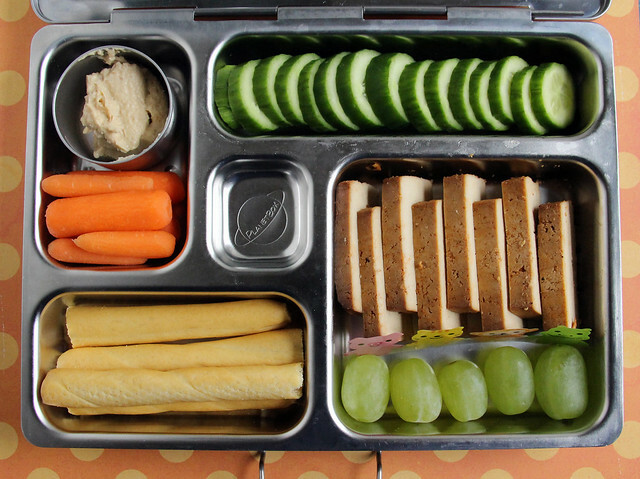 Carrots, cucumbers, grapes, apples — you will not see a single lunch down below that doesn’t contain at least two of those items. The lack of fun fruits and veggies is one of my least favorite things about fall and I think my boys feel the same way because we’re all getting a little tired of seeing the same things over and over. But there’s no arguing that they are tasty! 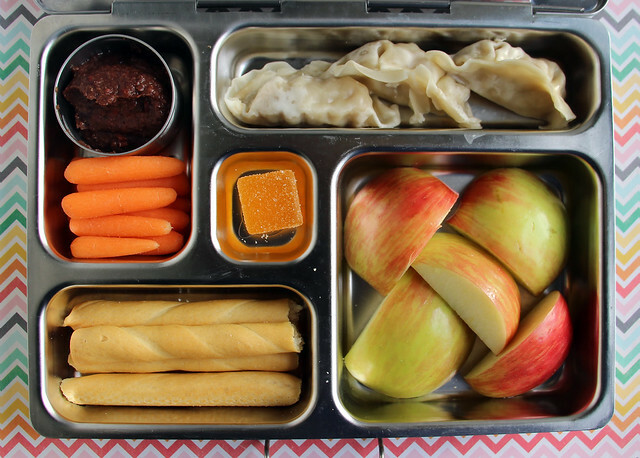 On Monday, I packed Wyatt’s lunch in the PlanetBox : black bean dip, carrots, dumplings from the freezer, apples, breadsticks and a jelly candy. 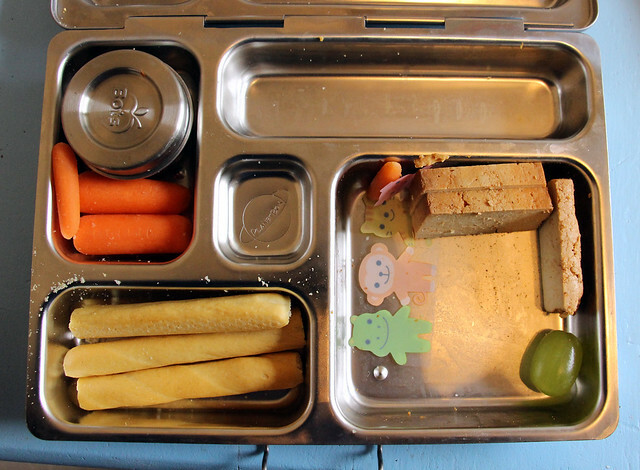 Augie’s lunch was packed in the new Lego Box : dumplings, bread sticks (in a smaller Lego box ), Persian cucumbers, carrots and hummus in an even smaller Lego box. 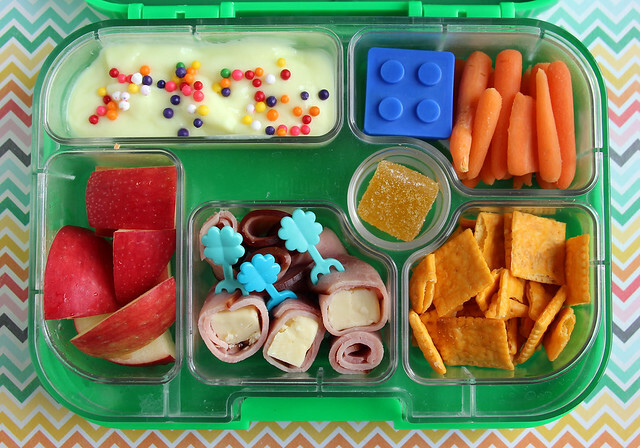 Tuesday, Wyatt had lemon yogurt with sprinkles, carrots and black bean dip, Cheez-its, white cheddar chunks wrapped in strips of ham and speared on blue clover picks, apple chunks and a fruit jelly. 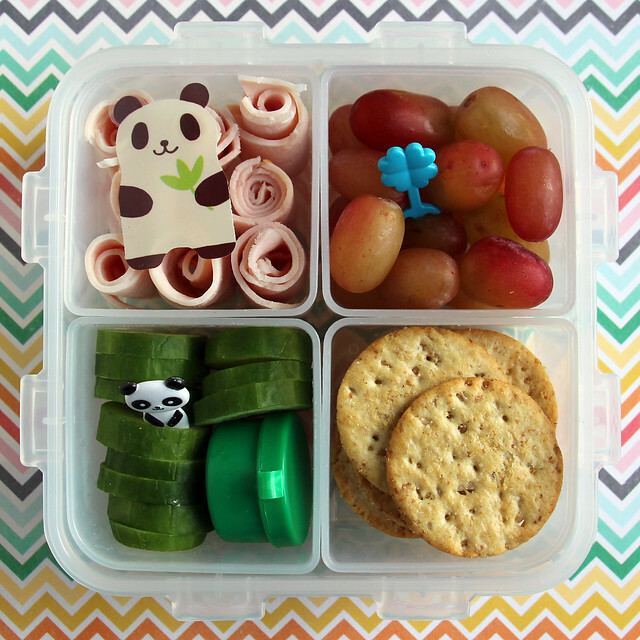 Augie had turkey spirals decorated with a panda food separator, grapes with a clover pick, crackers, cucumbers with a panda pick and a small pot of hummus for dipping. 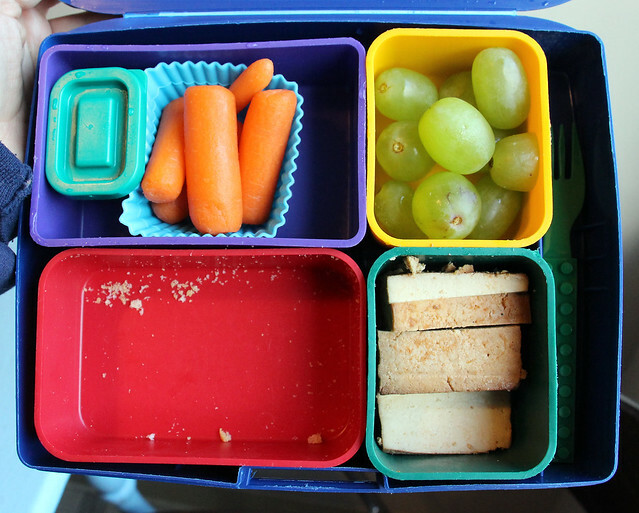 Wyatt’s lunch was packed in our old school Laptop Lunches box: black bean dip, carrots in a square silicone cup , green grapes, baked tofu cut into planks, and bread sticks. The only things missing were the breadsticks and a couple bites of tofu. Aargh! 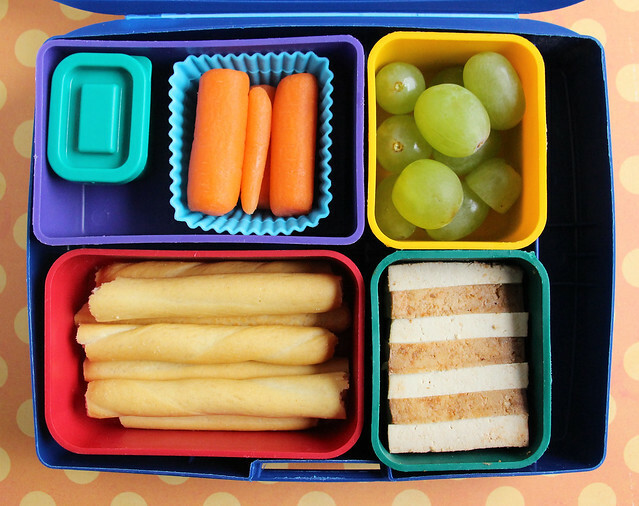 I packed Augie’s nearly identical lunch in the PlanetBox : hummus, carrots, cukes, tofu, grapes and breadsticks. It’s like they made a “do not eat lunch” pact in the morning. 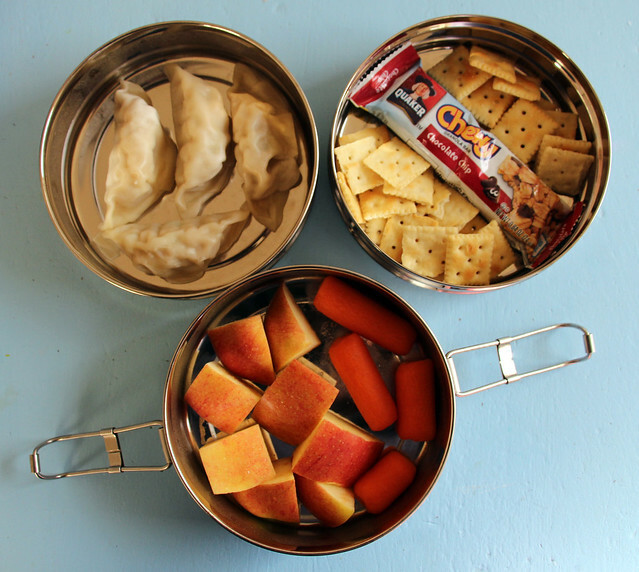 Thursday I sent Wyatt’s lunch in the ECOLunchboxes TriBento: dumplings, mini saltines, granola bar, carrots and apple chunks. 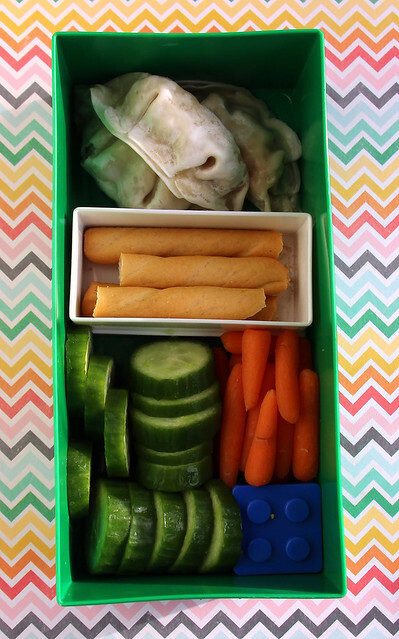 Augie had cucumbers, minis saltines, dumplings and apple chunks. This was packed in our LunchBots Trio. 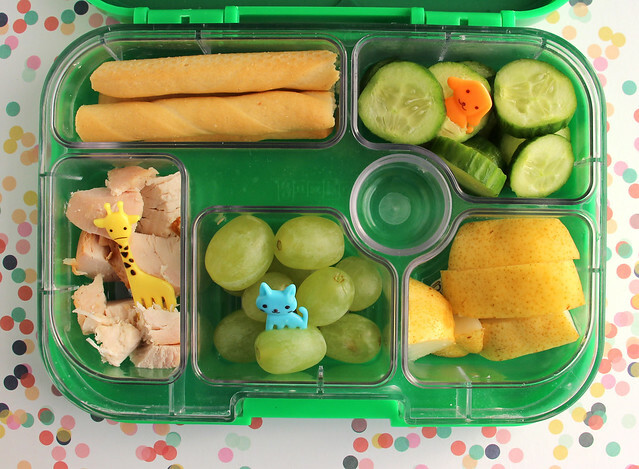 Today Augie had this Yumbox lunch: breadsticks, cucumbers, pears, grapes, roasted chicken chunks. I jazzed it up a bit with some cute animal picks.